During May 2008, a salvage excavation was conducted in the Nahalat Yehuda quarter of Rishon Le-Ziyyon (Permit No. A-5433; map ref. 181947–72/655055–71), after ancient remains were discovered during an antiquities inspection prior to construction. The excavation, undertaken on behalf of the Israel Antiquities Authority and underwritten by the Aviv Family, was directed by A Bouchenino, with the assistance of A. Hajian (surveying and drafting), T. Sagiv (field photography), L. Yihye (preliminary inspections), B. Antin (final plans), C. Amit (studio photography), Y. Kupershmidt (metallurgical laboratory), Y. Bukengolts (pottery restoration), M. Shuiskaya (pottery drawing), N. Katsnelson (glass), O. Shorr (glass restoration), C. Hersch (drawing of glass vessels), G. Bijovsky (numismatics) and P. Gendelman (seal impressions). Special thanks are due to the Aviv and Shalom families for their kindness and hospitality. Two squares were opened; one was excavated manually (A; Fig. 1) and the other (B) – with the aid of mechanical equipment. A large refuse pit (6×10 m, depth c. 4.5 m), which contained a plethora of ceramic artifacts, coins and glass vessels that dated mostly to the Byzantine and the beginning of the Early Islamic periods, was exposed. The pottery finds included a very large quantity of jars – two of which were intact – a few open bowls, cooking kraters, amphorae, lamps – six of which were intact – and a tiny intact bowl.A few of the pottery vessels dated to the Persian period. The numismatic finds included three coins from the sixth–seventh centuries CE and one coin from the eighth century CE (Bijovsky, below). The glass artifacts dated to the fourth–fifth centuries CE (Katsnelson, below). Building remains from the Roman period, a refuse pit from the Byzantine period and tombs were discovered in previous excavations that had been carried out in Nahalat Yehuda (HA-ESI 121, HA-ESI 121; and License Nos. B-32/1998, B-162/1998, B-20/1999). The pottery finds from the Persian period included a mortarium (Fig. 2:1), dating to the sixth–fifth centuries BCE and a base of a torpedo-type jar (Fig. 2:2), dating to the seventh–fourth centuries BCE. The pottery finds from the Byzantine and the beginning of the Early Islamic periods included a cooking pot lid (Fig. 3:1); cooking kraters (Fig. 3:2–9), which comprise two types: a small open cooking krater with a slightly everted side and a somewhat round base (Fig. 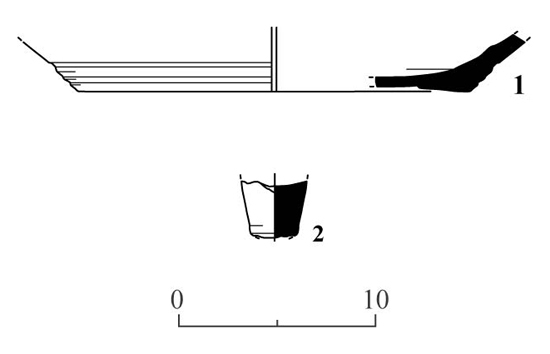 3:2–5) that is dated to the Late Byzantine period, and a cooking krater with two horizontal handles, a flat rim with a triangular cross-section that is adapted for a lid and straight sides (Fig. 3:6–9), which was common to the Roman, Byzantine (widespread in the fourth–fifth centuries CE) and Early Islamic periods; jars, which form a significant portion of the ceramic finds and include bag-shaped jars of orange clay, with an upright neck, ribbed sides and two loop handles (Fig. 4:1–8) that are dated to the Byzantine period and continued into the Early Islamic period, and Gaza jars that have no neck, a thick wall, elongated body, two loop handles on the shoulder, a short flaring rim and a narrow flat base (Fig. 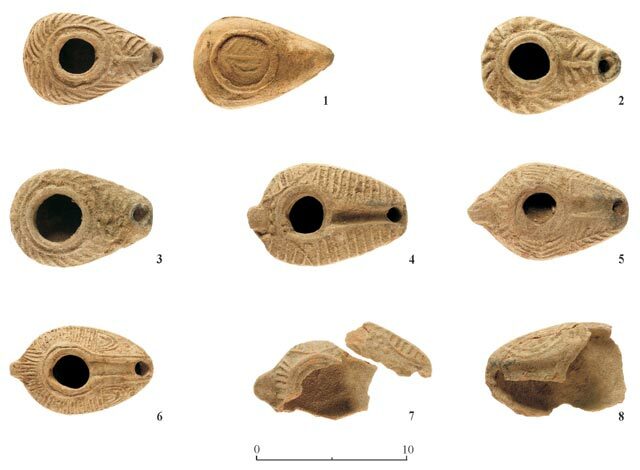 4:11–15); they are characterized by clay spreads on the shoulder and are common throughout the entire Mediterranean basin in the Byzantine period; stoppers for bag-shaped store jars (Fig. 4:9, 10); imported amphorae (Fig. 4:16–18) that were produced in the eastern Aegean Sea or in the Balkan, among them an amphora with two seal impressions that are stamped on the neck (Fig. 4:16; Gendelman, below); a tiny amphoriskos (Fig. 4:19) that has a rounded and thickened rim and a flat base; flasks (Fig. 4:20, 21), one of which (Fig. 4:21) is dated to the end of the Byzantine–beginning of the Early Islamic periods; and lamps (Fig. 5:1–8) that have a piriform body, trapezoidal cross-section, two ridges around the filling-hole and a coarse decoration of lines, bows, and a ladder pattern on the nozzle. Candlestick-type lamps are in Fig. 5:1–3; the lamp in Fig. 5:1 is decorated with a seven-branched menorah that stands atop a tripod and its base is decorated with the branch of a tree. The lamps are dated from the middle of the sixth to the beginning of the eighth centuries CE. The lamps in Fig. 5:4–8 have a horizontal lug handle and a shallow channel that leads to the wick-hole. The lamps in Fig. 5:4, 5, which have a straight nozzle, are Samaritan lamps from the sixth–eighth centuries CE. The lamp in Fig. 5:6 is dated to the eighth century CE. 1. Basket 5000, Locus 500, IAA 118996. Justin I, Nicomedia, 518–522 CE. Obv. : DNIV¸TI NV¸PP bust r. diademed, cloaked and wearing armor. Rev. : Msurrounded by crosses, beneath: B, below the line: NIKM. Æ, follis, ↓, 16.98 gr, 18 mm. 2. Basket 5001, Locus 500, IAA 118998. Justin II, Constantinople, 576/577 CE. Rev. : M, to l.: ANNO; Above, cross; to r.: Date: XII, beneath: Δ, below line: CON. Æ, follis, ↑, 13.19 gr, 28 mm. 3. Basket 5008, Locus 501, IAA 118997. Byzantine, imitation, Alexandria, sixth–seventh centuries CE. Rev. : I + B, beneath: [AΛEΞ]. Æ, nummia, cast, 0.34 gr, 11 mm. 4. Basket 5007, Locus 501, IAA 118999. Umayyad post reform, eighth century CE. Obv. :لا١ﷲ / ۱ﻻاﷲ / ﻭﺤﺩﻩ. Æ, fals, cast, 2.67 gr, 20 mm. Walker 1956: 210, No. 638. The excavation yielded 176 glass fragments from an unsealed construction dump (Loci 500, 501, 503). The corpus consists of free-blown domestic ware, dating to the fourth–fifth centuries CE and including bowls, bottles, wineglasses, oil-lamps and a cosmetic vessel. The free-blown spoon (Fig. 6:17) and the mold-blown square jug (Fig. 6:13) are rare finds. The uniformity of the types, the striking similarity of the greenish blue glass fabric and the slightly careless workmanship indicate that the vessels were manufactured in the same local workshop. Comparable assemblages come from nearby contemporary sites, particularly Khirbat el-Ni’ana and Kh. el-Fatuna, which are regarded as possible production centers in the region. Hence, the corpus from Ras Abu Dahud is small, but an important addition to the geographical and quantitative distribution of certain types of glass vessels that were manufactured in the area during the early Byzantine period. Bowls: Most of the glass fragments belong to bowls. 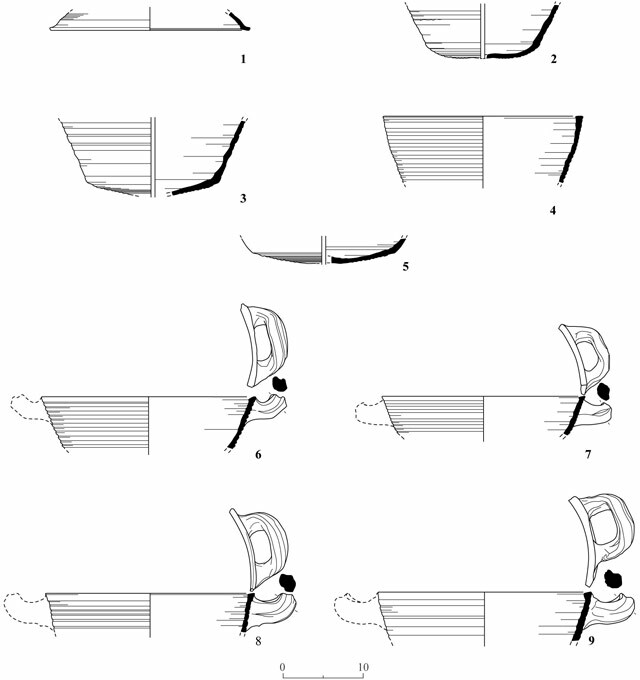 Plain versions with out-folded rims (Fig. 6:1, 2) were found alongside bowls adorned with trails (Fig. 6:3, 5, 6). The latter are a regional type, produced in the fourth–early fifth centuries CE. They have characteristic thin slanting walls and a multi-trailed decoration below the rim, which is out folded in Fig. 6:3 (dark blue trail) or rounded in Fig. 6:5 (pale greenish-blue trail) and in Fig. 6:6 (dark blue trail). The bowl in Fig. 6:4 is plain yellowish green with a rounded rim. Two types of bowl bases, widespread in Palestine during the fourth–fifth centuries CE, were recovered: hollow ring bases (Fig. 6:7, 10) and trail-wound bases (Fig. 6:8, 9); the latter also belonged to a specific local production. Bottles: Fragments of bottles with a trailed cylindrical neck were found; the first (Fig. 6:11) has a rounded upward rim and the second (Fig. 6:12) has the beginning of a piriform body and belong to characteristic Byzantine bottles, produced mainly from the fifth century CE onward. Jug: The shape of the square body with a high concave base (Fig. 6:13) was obtained by blowing the bubble into a mold. Square jugs are frequent in the Roman period and uncommon in Byzantine contexts; therefore, this fragment may be dated no later than the fourth century CE. Wineglass: The fragment of a hollow ring base, beaded stem and the beginning of a bowl (Fig. 6:14) belongs to a wineglass of a type that appeared in the fifth century CE and was widespread during the Byzantine period. Oil-lamp: Theconicalhollow stem with thick tapering walls and a solid flat base (Fig. 6:15) belongs to a suspended stemmed oil lamp, typical of the fifth–sixth centuries CE. Double-tube vessel: Part of the plain double-tube body, a flat solid narrow base, and a piece of the rim survived of the vessel (Fig. 6:16). This cosmetic container represents one of the most common local types, produced in the fourth–fifth centuries CE. Spoon: The spoon (Fig. 6:17) has an oval shallow bowl, made of two layers of glass pressed together. The rim and the handle, of which only a small piece survived, were made as a hollow tube. Blown glass spoons are quite rare in local excavations. This piece may be dated to the fourth–fifth centuries CE, compatible with the dating of the other vessels in the assemblage. Several fragments of imported amphorae were discovered among the plethora of locally produced pottery that generally dated to the seventh and early eighth centuries CE and was dumped in large pit. Two amphora fragments represent a distinctive type of a globular amphora, with a tapering neck and a thickened rim, which is made of light brown fabric that contains some mica. These amphorae are the latest variation of LR Amphora 2 (Riley J.A. 1979. Coarse Pottery. In J.A. Lloyd, ed. Excavation at Sidi-Kherib-Benghazi (Berenice), II (Libia Antiqua Supp. V). Tripoli. 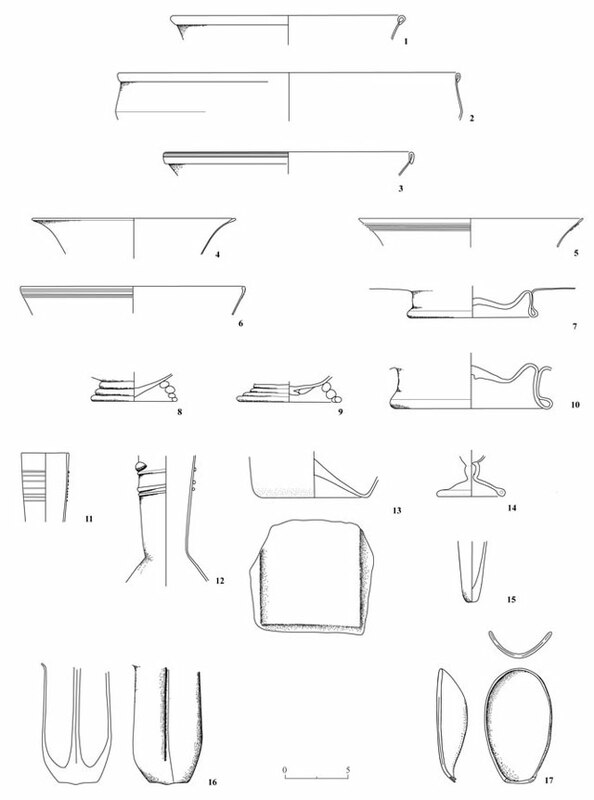 Pp.217–219, Fig.44) which is dated to the seventh century CE (Hayes J.W. 1992. Excavations at Saraçhane in Istanbul. Vol. 2 The Pottery. Pinceton. Pp. 66, 69–71, Figs. 23:2, 8; 47:171, 172, Type 10/28-29). Seven hundred such amphorae have been found in the Yassi Ada wreck of c. 625 CE (Bass G. F., van Doorninck F. H. Jr. 1982 Yassi Ada. A Seventh-Century Byzantine Shipwreck. College Station, Texas. Pp.157–165, Figs. 8-4–8-6). These amphorae seem to be produced somewhere in eastern Aegean and/or the Balkan region. One of the amphora fragments bears two circular stamp impressions on the mid neck zone, between the handles. One stamp (diam. 2.8 cm) has two capital Greek letters, B and K. The second worn stamp (diam. 2.6 cm) shows a frontal draped bust, wearing an elaborate crown or helmet and holding some object, probably a cross, on left. Although stamps on Byzantine amphorae are not a regular feature, a few figurative stamps have been reported. A most similar stamp appears on a handle fragment that was found in the Saraçhane (Istanbul) excavation. The fragment bears a circular stamp with a frontal bust that has a cross on the right and an inscription ΠΙΠΤΟС (Hayes 1992:77, Pl.13:3). The significance of the stamps is not clear. The stamp letters beta and kappa may have a numeric value and may have marked the capacity volume of the amphora (kappa=20 and beta=2, i.e., 22); they could also be the abbreviation of the fabricant’ name or the name of the place where the amphora was produced. Byzantine amphorae rarely bear stamps with personal names (Hayes 1992:70–71, 77, Figs. 27:2, 47:197, Pl.13:3; Opaiţ A. 2004. 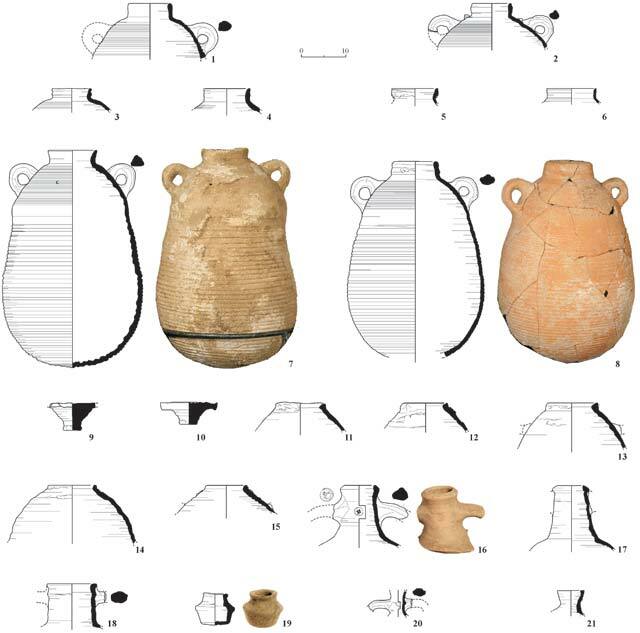 Local and Imported Ceramics in Roman Province of Scythia (4th – 6th centuries AD: Aspects of economic life in the Province of Scythia [BAR Int. S. 1274]. Oxford. Pp. 8–9). The second stamp shows closer affinity to the depiction of Byzantine emperors on coins from the time of Justinian I (527–565 CE). The same observation was made with regard to the stamp from Saraçhane (Hayes 1992:77). The combination of both stamps on the amphora fragment might suggest that this vessel had been manufactured and its content was produced in one of the Imperial estates. Although most of the finds in the refuse pit dated to the Byzantine period, no settlement has so far been discovered in the vicinity, to which the pit could be attributed. One of the coins discovered above surface is dated to the Umayyad period, following the reform (eighth century CE; Coin 4, above); it may possibly indicate the presence of a settlement in the region at the beginning of the Early Islamic period. 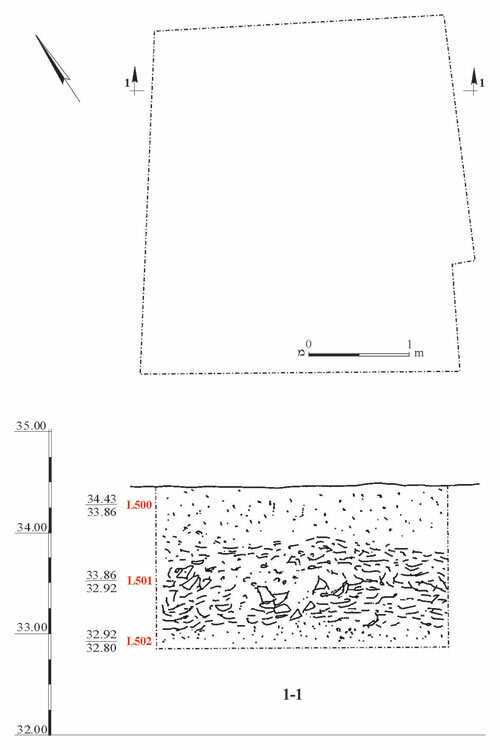 The large quantity of jars in the refuse pit seems to suggest that a cistern or an installation that were connected to the wine or olive oil industry had existed in the area.